I’ve always thought of the bread and water of the sacrament–the body and blood of Jesus–as emblems of his death only. That makes sense–the ordinance is to commemorate the Atonement. But lately I’ve also been focusing on how it could direct us to his life, as well as his death. The prayer on the water says, “the blood of thy Son, which was shed for them” (D&C 20:79), that second part explicitly directing us to think of Lord’s infinitely painful sacrifice that last night and day of his life. The prayer on the bread, however, only mentions “the body of thy Son,” with no added description like there is on the water. UPDATED 12.4.2017 Here is a PDF of the newest revised draft–it still isn’t complete, but it’s a huge improvement over the original. 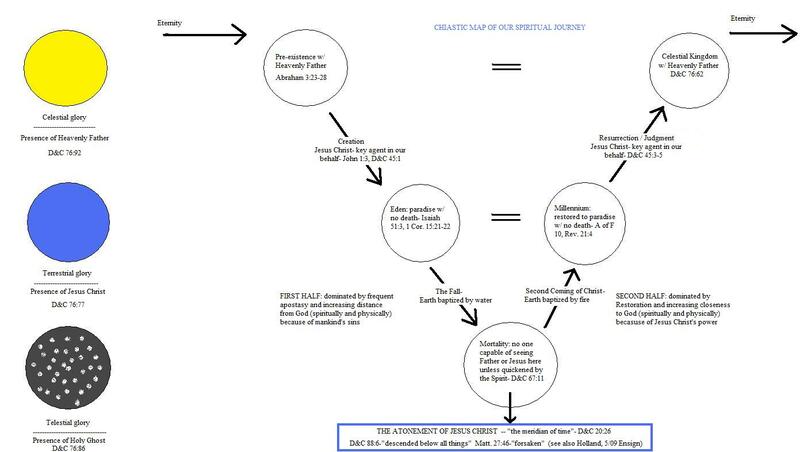 This graphic is a rough draft of a project I’m working on—organizing all the standard works of the LDS Church into a single timeline. I think this will be a valuable scripture study tool because it will help us see these writings outside of their monolithic arrangement in our books, and inside their chronological contexts. For example, instead of seeing the Old Testament as the law, and then the writings, and then the prophets—where the timeline actually ends halfway through the Old Testament and then doubles back to fill in the narrative with the writings of the various persons in that narrative—we can read it in the order in which all of its contents occur. It will aid understanding and appreciation. This makes sense. Not only the Bible benefits from this, though. By integrating its unique scriptures into this timeline, we can really see just how much time the book of Ether occupies, and how much the early Book of Mormon authors were in tune with the events of the end of the Old Testament. We can see Book of Mormon stories filling in the gaps between the two testaments, and continuing the tragic legacy of the earliest Christian era after the New Testament ends. We can see how complicated the “flashbacks” in the books of Mosiah and Alma are. Much of this is speculative. I’m happy to hear from anyone with refinements. I intend to keep revising it, myself. As I said, this is only a draft. Narratives that take place at the same time—or nearly so—are presented next to each other. This is most important in the four gospels. I’ve used the gospel harmony available here at lds.org for this, as well as the chronological order of the Doctrine and Covenants, available here. These are both products of the LDS Church, not mine, and they belong to the Church. The Bible chronology is one that is widely available online (for example, here, here, and here); I have modified it only very slightly where I thought useful. The color coding should help us all to follow the flow and see the connections between the various bodies of scripture. The first three—the law, writings, and prophets—are traditional divisions of the Old Testament (see Luke 24:44). Probably the single coolest phrase in all of scripture, right there. In Doctrine and Covenants 123, Joseph Smith encouraged the Latter-day Saints to keep track of all the “libelous publications,” as well as property damage and physical abuse, they had suffered. Verse 5 uses this unique and memorable phrase to summarize that record: “the whole concatenation of diabolical rascality.” Isn’t it wonderful? First of all, it’s funny in the way that wordy phrases are, using multiple long, obscure words right next to each other. Also, it’s a perfect example of that 19th century style of excruciatingly exact wording. The individual words themselves are quite funny, too. “Concatenation.” Just say that one aloud. Everybody should definitely highlight this phrase in their own copies right away. And if you haven’t read the Doctrine and Covenants, you really should. Who wouldn’t want to read a book that has gems like this in it? A scripture study exercise: if we wanted to summarize the overall message of major collections of scripture, what might they be? We’re probably familiar with the “missions of the Church” formula–preach the gospel, perfect the saints, redeem the dead, care for the poor and needy–so, can we find similar missions communicated in books of scripture? Old Testament: I also considered “keep the commandments” and “follow the prophets.” The first is similar to “obey the law,” but not as inclusive–there’s more to the Old Testament than the “thous shalts” and “thou shalt nots.” Saying to “follow the prophets” resonates with us today, and certainly encompasses a major theme, but the largest idea in the Old Testament is that conforming to God’s whole system of living will bless us. Of course, the Lord uses the same phrase as Friedman’s title not to fret about scarcity, but to reassure us that He’s filled the Earth with enough to always provide for humanity. Friedman might like the follow-up that we’re obligated to use that abundance to care for those in need, though. The last few times I’ve been to the temple, I’ve noticed how the endowment addresses the nature of evil: frankly, honestly, directly, in an unflinchingly sober manner that leaves no doubt that we must face this enemy head on. It’s ironic that active Mormons are often stereotyped and mocked for living inside some kind of super-sterile, Pollyana-ish bubble, for I can think of nothing in the world so brutally clear about the pervasive presence of evil in the world–and our imminent danger from it–as the endowment. Unlike the schlocky nihilism of Hollywood, though, the temple does not revel in bleakness on this point. Just as the temple repeatedly stresses that we must each constantly strive to resist the darkness pressing in on us from all directions, it likewise very clearly teaches us the way to be delivered from that darkness. Such a lesson may be the primary mission of the temple. During a recent session in the temple, I was hit with particular force that we are to study the law of consecration not in general, not in a vacuum, but specifically as it is taught in the Doctrine and Covenants. Besides the factual and motivational information I’ve found in this brief project so far, I’ve been impressed that this aspect of the gospel agrees so well with our growing emphasis on charity and service, as per President Monson (best exemplified in adding “care for the poor and needy” to the mission of the Church). D&C 42: 30-39 (D&C 51: 2-19; D&C 58: 35-37) principles of consecration explained. D&C 42: 30, 39 consecrate of thy properties for support of the poor. D&C 42: 32 consecrated properties not to be taken from church. D&C 49: 20 one man should not possess above another. D&C 51: 3 every man equal according to his family. D&C 51: 5 transgressor not to have claim upon portion consecrated to bishop. D&C 58: 36 (D&C 85: 3) a law for inheritance in Zion. D&C 78: 5 order established that saints may be equal in bonds of heavenly and earthly things. D&C 83: 6 storehouse kept by consecrations. D&C 105: 5 Zion can only be built up by principles of celestial law. D&C 105: 29 lands to be purchased according to laws of consecration. D&C 105: 34 let commandments concerning Zion’s law be executed and fulfilled. D&C 124: 21 bishop to receive consecrations of the Lord’s house. 1. Are you contributing to or detracting from a spirit of unity in your home? in your ward or branch? in the Church as a whole? 2. Is your life in harmony with the Spirit of the Holy Ghost so that you will contribute to a unity of thought and action in the kingdom? 3. Do you truly have an attitude of consecration? Is your primary concern in life to consecrate everything you have or with which you will be blessed to the building up of Zion and the Church on the earth? 4. Do you have enough confidence in your commitment to truly say, “I am willing to sacrifice anything and everything for God”? For me, the scariest verse in all of scripture has always been D&C 103:2: “And that same sociality which exists among us here will exist among us there…” It’s hard enough to be a shy introvert now without having to be surrounded by people throughout eternity, too! But there’s an important lesson in that truth about the nature of real spirituality, and it’s one that I’ve long been trying to learn. Other teachings in the Doctrine and Covenants affirm that being sealed in the temple is necessary to qualify for exaltation, the highest salvation with which anyone can be blessed. For example, D&C 131:1-2 reads, “In the celestial glory there are three heavens or degrees; and in order to obtain the highest, a man must enter into this order of the priesthood [meaning the new and everlasting covenant of marriage],” and the very next section contains this even more explicit promise: “And again, verily I say unto you, if a man marry a wife by my word, which is my law, and by the new and everlasting covenant…they shall pass by the angels, and the gods, which are set there, to their exaltation and glory in all things…” (D&C 132:19). Elder Holland’s recent Conference talk about the intense depth of suffering experienced by the Savior for the Atonement–and the Church’s incredibly successful YouTube clip from it–have got me thinking about how this episode also teaches us perhaps history’s greatest lesson about charity. Sometimes I’m tempted to pull my head back into my shell and call it quits as far as the world is concerned. I think we all feel that way sometimes. Work is stressful–or lost, finances are tight, illness is soaking up strength, family problems are heartbreaking, addictions are threatening, or a combination of these or any of a thousand other adversities conspire to drag us down. Often we may feel that the best option to preserve what little sanity we have left is to circle the wagons and just worry about yourself, and let the rest of the world go its way. When this temptation surfaces, it’s good to remember how the Savior conducted himself in the midst of the Atonement. In the Garden of Gethsemane, as Jesus Christ felt infinitely for “pains and afflictions and temptations of every kind; and…the pains and sicknesses of his people…their infirmities…[and] the sins of his people” (Alma 7:11-13)–truly, every negative experience every mortal has been, will be, or even could be called to pass through–a sacrifice so profound that the “suffering caused myself, even God, the greatest of all, to tremble because of pain, and to bleed at every pore, and to suffer both body and spirit–and would that I might not drink the bitter cup, and shrink” (D&C 19:18), He did not pull his head into his shell, or circle the wagons, or give Himself up to worry or self pity, letting the rest of the world fend for itself. The popular maxim “work smarter, not harder” is pure hogwash. It implies that clever tricks can supplant sustained effort. While effectiveness is unarguably a virtue, nothing can take the place of sweat. In teaching, we can implement all the cutesy activities, routines, and fads that the educrats can imagine, but the bottom line is that no class will be optimally productive unless the teacher is giving enthusiastic direct instruction, then guiding students through practice. Even during in-depth independent work, we teachers must be circulating the room, checking on student work one on one. It’s exhausting, but nothing less produces the best results. It’s inconvenient for me, too, but we can’t just sit at our desks for an hour and occasionally bark orders and expect real learning to just happen. In church service, it’s even more true. No amount of efficient program planning, curricular correlation, or assignment reporting–worthwhile as those things all are–will ever do half as much good as simply rolling up our sleeves and bringing gospel messages to people in their homes. Passionately involving ourselves in people’s lives with meaningful service is going to take far more effort than the bare minimum requirements of any calling or ministry, but it’s also absolutely necessary to help grow anyone in the direction of Zion. Clichéd as it is to lament the passively entitled mindset of contemporary society, it’s still true. If we want to help the world remember the value of good, plain, old fashioned hard work, we must, as Gandhi said, be the change we wish to see in the world. We may sometimes feel the need to step back and rest, but we can’t let it become a habit; the stakes in the things we care about are too high. Wear out, don’t rust out.